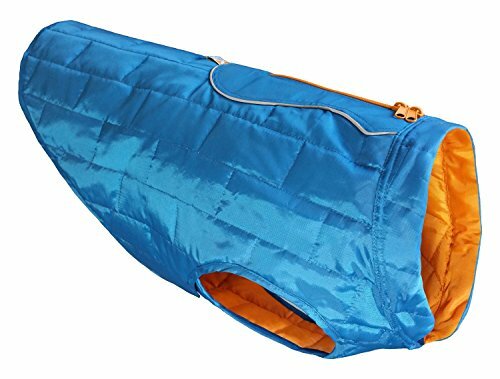 If you’re searching for some of the best things to keep your dog warm in the winter, you’ve come to the perfect place. We’ve put together a selection of products that might assist you in ensuring this task. Following our detailed analysis, we came to the conclusion that the first option you ought to take into account is the Petmate Indigo house. It’s a resilient shelter for your precious Fido as it comes with a heavy-duty construction that manages to provide the much-needed insulation in both hot and cold weather. 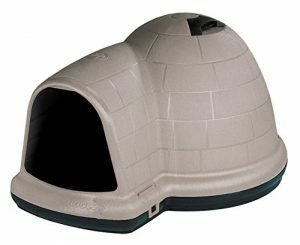 There’s a set of vents located at the top of the igloo, so your dog won’t feel like he or she is cooped up inside. If this house isn’t exactly what you’re looking for, do check out the My Busy Dog Reflective dog shoes, especially if your pooch lives indoors. Insulated against cold and hot weather alike, this shelter features a sturdy construction which can withstand heavy-duty use through the seasons. Designed so as to keep your pet warm in winter and cool in summer, this item is equipped with an offset doorway which provides additional protection against wind and rain. In addition to this, the ventilation system fitted in the roof of the house circulates fresh air for your pet’s comfort. The shelter may be too small for large breed dogs. A comfortable shelter to keep your dog safe from inclement weather all year round. 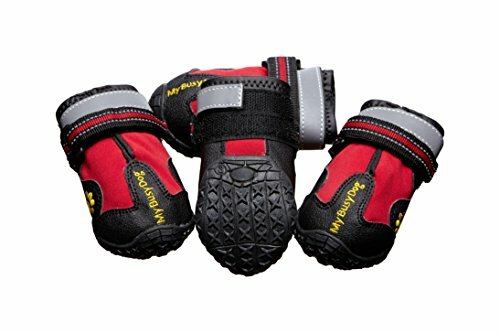 These boots are designed so as to protect your dog’s paws against the heat of the asphalt in summer and to provide anti-slip and waterproof features in winter. As this model is water-resistant, you’ll no longer need to worry about wiping your pet’s paws when coming home after a walk in muddy weather. Moreover, these shoes provide the necessary protection for dogs who suffer from arthritis and are dragging their rear paws. Some users say the shoes slide down or come off easily. 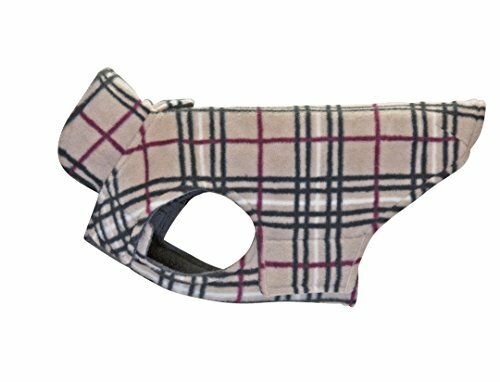 A very practical accessory for dogs who need extra protection for their nails and paws. 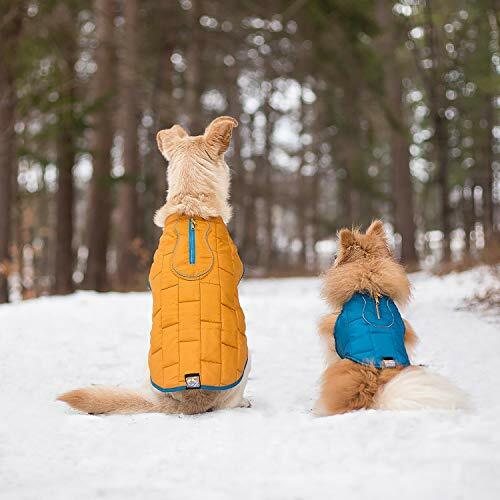 This padded vest features thermal insulation to protect your dog from cold weather and sports waterproof features so it can be worn in the rain without becoming soggy. For your own comfort and your pet’s, the leash can be attached directly to the jacket and the zipper is sewn on the back. In addition to this, the special protection ensures that your pet’s fur won’t get caught in the zipper by accident and cause any discomfort. On occasion, the vest size didn’t match the size tag. 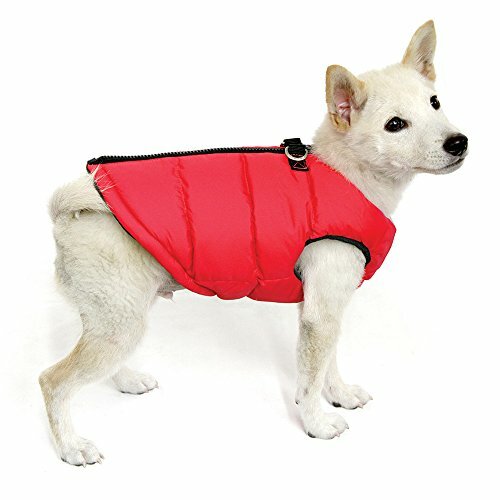 A multifunctional vest to keep your pet warm and dry in snowy and rainy weather. There are many things you could be after if you want to make sure that the comfort of your pet is on par even as the cold season starts to make its presence known. We’ve written extensively about these topics, so we would like to recommend that you check out some of our other posts. From effective dog boots to dog kennels – we’re sure you’ll find the right product if you read these posts. Don’t forget that your pooch’s paws can suffer a lot in the winter, so do consider getting dog shoes for winter and some coconut oil for dogs so that you can keep his or her toes perfectly healthy. Below you’ll find some of our favorite alternatives of making sure your fluffy friend never gets cold. Nothing beats a dog house if you’re searching for an efficient shelter from rain and other types of inclement weather. Petmate’s option is good quality. It’s made of heavy-duty materials, which means that your Fido will be able to use it time and again, without you having to worry about its durability. Besides, it even features roof ventilation as there are a number of vents located on the top. This addition comes in handy both when it’s warm outside and when it’s cold because the house can end up feeling like a little sauna if the animal spends a lot of time inside. The easy-snap design boasted by this alternative means that you won’t have a hard time putting it together. It’s available in three sizes ranging from medium to extra-large, so you can get the one that best suits your pet. Some customers note that they wish the product were just a bit bigger, so get a more sizeable one if you aren’t sure. Your pet’s feet have to be protected in an appropriate manner when it is cold outside. These boots can make it possible for every walk to become significantly more comfortable, and there’s a notable advantage for you, as the pet parent, too. You won’t have to clean your pooch’s paws every time you get back to the house. The shoes are water-resistant, which means that they are a great choice for when winter starts turning into spring and there are puddles everywhere. They are also quite flexible, which means that you won’t have to get frustrated as you put them on and take them off. Additionally, the reflective design is a pro in itself as you won’t ever lose sight of your pet even if you prefer taking nighttime walks in the park. Even if you aren’t interested in getting them specifically for the cold season, they can be worn anytime and they’ll protect your dog’s paws from thorns or worse, shattered glass. Purchasing great dog coats for cold weather can ensure the overall comfort of your doggy. This one by Gooby is available in several sizes. It’s functional as it works both as a vest harness and as a coat, and the zipper that it is equipped with has a safeguard. Why is this important? The short answer is that the safeguard can prevent mishaps such as the fur getting stuck in the zipper. The vest comes with a water-resistant layer, so you can take a walk even when it’s pouring outside. For easy cleaning and maintenance, the manufacturing brand has designed the option so that it can be washed in the washing machine. 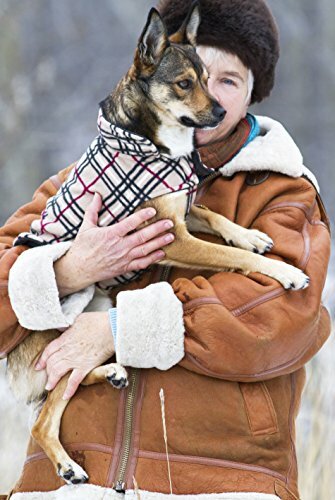 One of the best features of this coat is that it comes with an inner fleece layer that will provide plenty of cushioning and more than enough comfort to the animal. The only thing you have to pay attention to is the length of your dog’s body when you place your order. This is another model you could go for if you’re worried about outdoor temperatures dropping to a dangerous level for your pup. The jacket comes with dual layers of fleece, which means that the animal’s thermal comfort is ensured adequately. One extra feature that we need to mention is that there’s a welt design along with a flap cover that you can use to attach the leash. The coat is available in a broad array of sizes and they range from 8 to 30, so you’re more than free to pick the one that best suits your Fido’s body. The brand is also quite responsive when it comes to providing answers, so if you’re ever feeling a little unsure about the size you should select, get in touch with the company’s customer support. The coat is durable, comfortable, and easy to put on and take off your pet, so that should give you plenty of reasons to give it a shot. Kurgo has a long-standing reputation of manufacturing quality products for pets, so we think you should at least check out the features of this coat before you make your final decision. The neatest thing about it is that its material is comfortable, as well as durable, so both your and your pet’s requirements will be met. Another aspect you should consider is that this model comes with a reflective design. So, again, if you prefer taking night walks with your pooch, this one can make for a reasonable choice. While this option isn’t waterproof, it is water-resistant, so you can at least use it for when the weather is rainy. It’s not a life vest, so it won’t do well in rivers or the ocean. To make sure you’re getting the right size, Kurgo has made available a helpful chart that can assist you in comparing your pet’s measurements to those of the products available. Chilly Dog’s alternative is undoubtedly worth taking into account as it is made to be cute, comfy, as well as durable. It’s one of the few units in this particular line that have been made from 100% natural materials and this one fits the bill since it is designed from wool. Not only will you be able to supply your pet with the necessary thermal comfort if you decide to go for the Chilly Dog Monkey Hoodie, but you will also support the fair trade activities from all over the world. The sweater is handmade, which means that every product is unique in its own way. One thing we have noticed by browsing through the consumer reports gathered by this choice is that there haven’t been as many complaints regarding sizing as they are in the case of similar options. The hoodie is easy to put on and take off and it can even be used indoors when it’s chilly. Because we’re aware that getting the perfect things to keep your dog warm when it’s cold outside can be a little daunting, we decided to give you a hand by putting together a guide about the many types of products you can find up for sale these days. We would suggest you check out some of our other posts. We’ve written extensively about Husky puppy shampoos, and we’ve also tackled other topics such as dog food for sensitive stomachs. This is perhaps the first question that you ought to ask yourself. It’s pretty clear that a dog that lives outdoors will have different needs compared to those of a pet that resides indoors, along with you and the rest of your family. While it’s easy to provide plenty of thermal comfort to the animal when he or she spends most of the time in your house, it’s not the same with outdoor dogs. If the pooch lives indoors, you’ll need protection for when you both go out for walks. Otherwise, the thermal protection has to be ensured all of the time. There are two ways of going about things if you are searching for a dog house. One common design is the kennel, which you can insulate on your own if you keep your dog in your garage in the winter, for example. The other alternative is to get a house that should be used outdoors. Of course, it’s quite difficult to make sure that the inside of that house doesn’t turn chilly. But there are many models that are insulated, so those are worth mulling over. We would suggest getting one with a door so that most of the heat is kept inside. Furthermore, you can even build your own dog house if you have DIY skills. One thing we’d like to add is that you can even put together a makeshift door by using a small blanket. 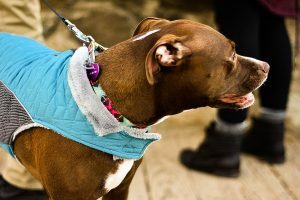 Another way of making sure that your dog doesn’t ever get cold when you take him or her out for a walk is to purchase a coat. In this case, you need to make sure that you measure out the girth of your dog’s chest, but there’s another factor you have to bear in mind, too, and it’s the length of the pooch’s body. As you might expect, a Dachshund has a longer body than a similarly sized breed. You need to check the size chart provided by the manufacturing brand and see whether the product you are thinking of spending your cents on is actually a good fit for the type of dog you are the parent of. Several other aspects that you have to pay attention to range from the material that the unit is crafted from to whether or not it is waterproof. Winters can differ largely from one area of the United States to the next, so in some places the weather might be freezing, but in others, it might just be rainy. A reflective design can be another helpful feature if you walk your dog off-leash in the park at night and you want to make sure that you never lose him or her. The way you will put on and take off the jacket is yet another factor to consider. Vests are a bit harder to work with because they’re usually made out of a big chunk of material and getting all the paws through the holes can be a challenge. Look for vests that come with handy zippers or adjustable closures so that neither you nor the dog get frustrated right at the door as you’re getting ready to leave the house and the excitement of going outside makes it difficult for the pup to remain in one place. Size matters when you’re shopping for dog boots. What might make it even more difficult for you over the course of your decision-making process is that some breeds have different sizes of front and back paws. Regardless, the shoes have to fit properly because otherwise, they’ll fall or fly off through the park and the last thing you might want to do is go on a hunt for them in the bushes. One design that has become rather popular over the years is the type of boot that is composed of two essential parts – one that looks like a shoe and a fabric extension that acts as a leg warmer. Your pooch will look like he or she is wearing socks, but they are quite effective. Another note that must be made concerning paw protection is that your dog’s toes can suffer because of a lot of things. There are many tiny things that can hurt that sensitive skin, even though it looks like it’s pretty thick. Things like branches and even shattered glass can affect those tiny paws. As such, we urge you to perform a close inspection of them when you get back home — especially if your dog hasn’t worn any boots. As weird as it might sound to some people, moisturizing the paws has to be done regularly, and you can do that with something natural, like coconut oil. There are several options when it comes to pet blankets. You can get one that can be worn as a coat, you can choose one that you can use indoors so that pet dander and hair don’t get everywhere, or you can select one that should always be utilized in the dog house. Furthermore, some models are electric, which means that you can get them heated and then leave them inside the outdoor dog house. These do well if they have the right amount of insulation as they might remain warm for a period of at least several hours. How to keep a dog house warm in the winter? Insulation is quite important when it comes to ensuring the thermal comfort in the dog house that you own. If the product is only made out of wood and there are tiny holes that the cold can get through, it’s not as reliable as a model designed from artificial materials. You could opt for a dog house that comes with a door so that the heat is kept inside. For days when the temperature has really gone down, you can use a heated blanket or even place bottles filled with hot water on the floor and then cover them with a regular blankie so that your dog rests on something warm. How to keep outside dogs warm in the winter? We’ve already talked about some of the ways you can achieve this purpose. You can get a coat, buy them boots, as well as resilient and insulated houses that can do their job precisely as they are supposed to. What we would insist upon, however, is that you don’t keep your dog outdoors when it’s really freezing out. Some breeds have a hard time dealing with cold weather, and those that have really short hair have a bigger chance of developing all sorts of breathing issues and even pneumonia. If you know a harsh winter is heading your way, it might be a better idea to keep your dog indoors or at least in your garage for some time. Technically no, but practically, they sure can. If you failed to treat your dog in the warm months and he or she hasn’t gotten rid of fleas or flea eggs, there’s a good chance that those are still lurking in the fur. In theory, fleas cannot survive low temperatures and that’s why they’re ‘not in season’ in the winter. But if your dog spends part of his or her time indoors, they can be quite resistant and can hide in the deeper layers of the fur, which renders them invisible to you (especially if the breed you’re the parent of has a lot of fur). Do dogs get dry skin in winter? As most other animals and just like humans, they can get dry skin during the cold season. This is especially true for those canines who aren’t used to spending time outdoors. Switching from one type of temperature (like the one in your home) to another (that of the outside environment) can also be a predisposing factor. But the areas that need a lot of care are your dog’s snout and your dog’s paws. To moisturise these, you can use some simple coconut oil — it doesn’t matter whether it’s fragranced or not. Don’t wash your dog’s fur too often – this can be another predisposing factor. How to keep dogs’ water from freezing in winter? The answer to this question is pretty simple and we’re sure you’re going to love how easy this solution is. All that you have to do is place an electric heated pet bed under the water bowl. Of course, this might be a little wasteful since you wouldn’t want to use that power only for heating up the water. So, that’s why we would suggest placing just part of the heated bed under the bowl so you can use part of the rest for the pooch’s body.